This is a sponsored post written by me on behalf of Universal for IZEA. All opinions are 100% mine. 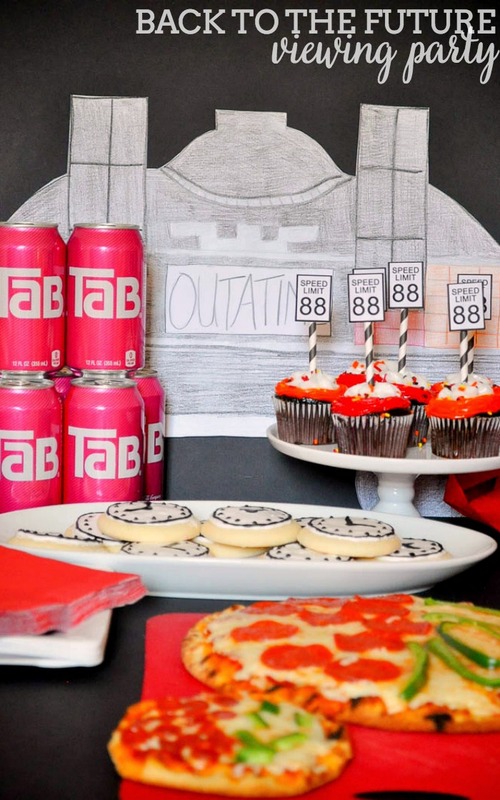 Celebrate your love for Doc and Marty with a fun Back to the Future Party! Can you believe it is the Universal 30th anniversary of Back to the Future?! Are you a fan? I just can’t get enough of Marty McFly and Doc’s antics and I would totally adopt Einstein into our family. There is just something so exciting about seeing the DeLorean zoom away. I’ve often thought about where and when I would want to time travel to, and I just think the decision is too overwhelming. If all of time is at your fingertips, there are just too many fabulous options. I could go meet family members, hang out with Audrey Hepburn and Cary Grant, see the Eiffel Tower being built and more! Whatever the choice would be, I would definitely hop into the DeLorean with crazy Doc. As a huge fan of the series, I definitely will use this 30th anniversary and re-release of the movie on Blu-Ray as an excuse to have friends over for a Back to Future Viewing Party! I mean, Marty did travel to 2015 – October 21st to be exact. People in Chicago were really hoping the series was right about the Cubs, too. 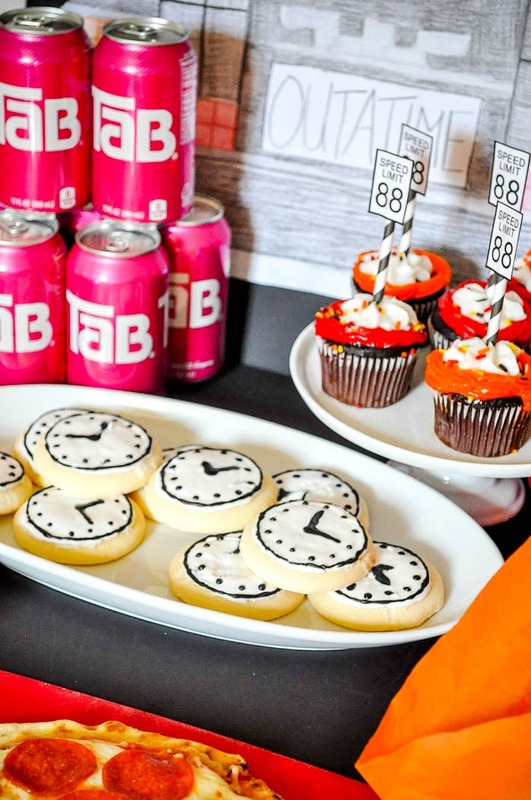 All of these ideas would make an awesome birthday party, too! 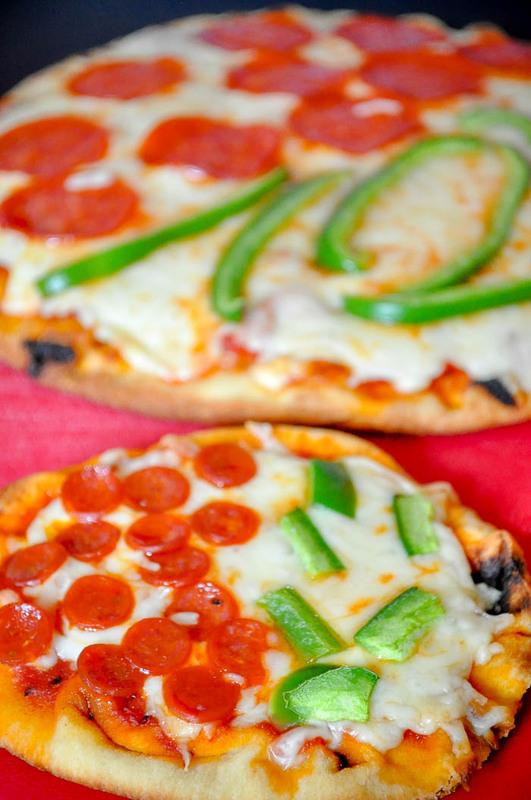 If you are feeding friends or family, you need to serve up mini and large pizza, half pepperoni and half green peppers. It will be the best hydrated pizza around. 😉 To make it easy, I purchase Stonefire flat bread so I don’t have to make dough from scratch. It makes the whole process nice and quick. I top with pizza sauce, mozzarella cheese, and the pepperoni and green peppers. Bake for 10 minutes at 350 degrees. 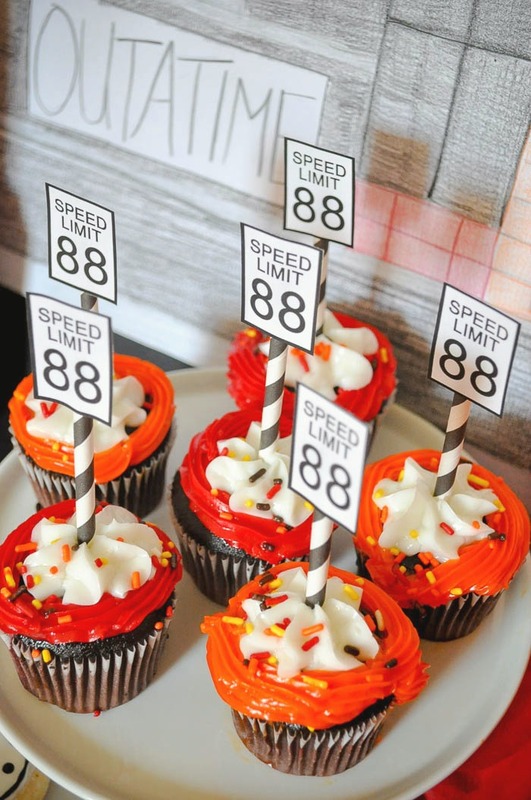 I also made fun little cupcake toppers for some chocolate cupcakes – Speed Limit 88. Lastly, I made round sugar cookies and added white icing. 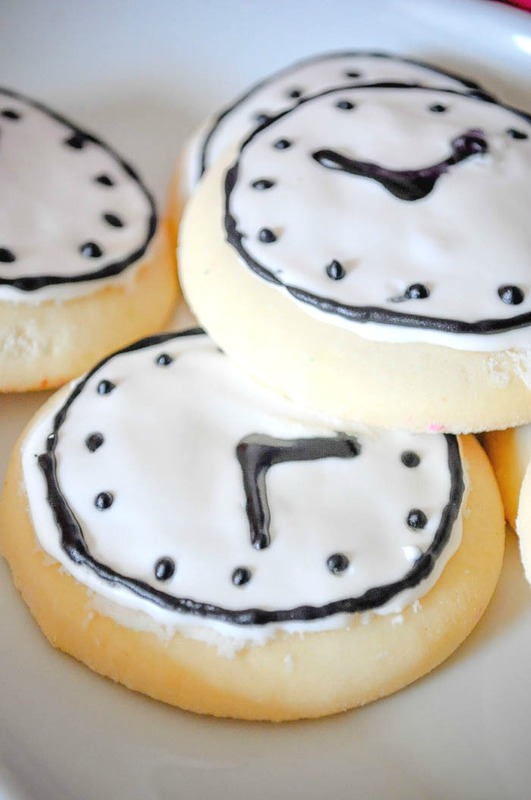 Then, using black icing, I added clock tower details with the time 10:04. It’s the time the clock got struck by lightning. Picking a beverage for the party was super easy for me. There was only one choice – TAB! 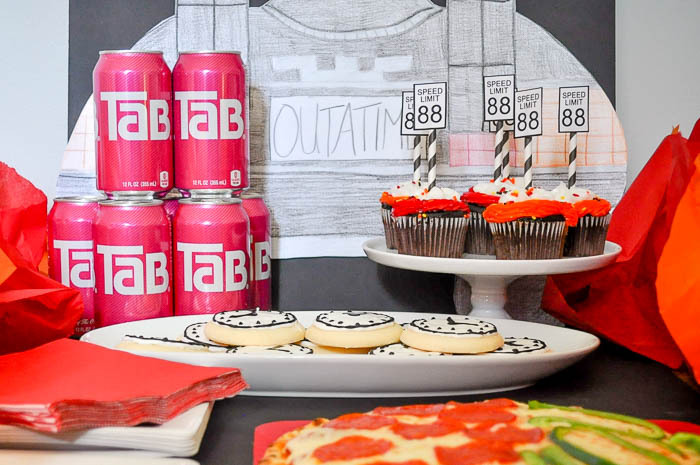 If you don’t remember, TAB was the drink Marty tried to order back in the 50s at the cafe. The response? “I can’t give you a tab unless you order something.” Okay, baed on the scene, Pepsi Free would have also been a great choice but I don’t think they make it anymore. With a friendly viewing party, I don’t want to spend a ton of time on decor but I definitely want a fun touch. For this party, I use black foam board on the table as a road and propped up in the back. I drew the back of the DeLorean onto white poster board and colored it, taping it onto the back black foam board. Then, I added red and orange tissue paper to the sides leading up the car to represent the flames caused by the time travel. If you don’t want to host your own event right now, you should check out Universal‘s social media outlets for more information about the release and possible live events going on. Head over to their Facebook and Twitter. 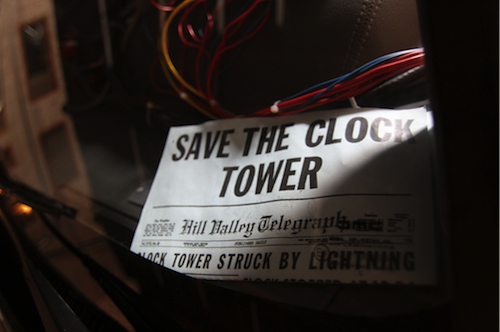 What is your favorite part of the Back to the Future series? !